She was the first sound healing/meditation specialist for the military at Ft. Hood Army Warrior Combat Stress RESET Program in Killeen TX. 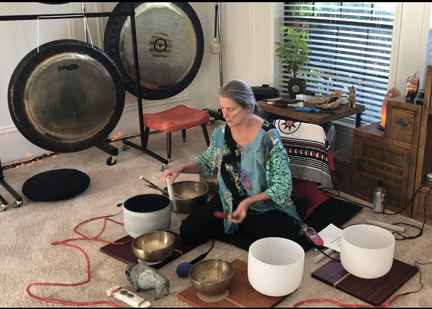 Jodi is an anthropologist trained in cross-cultural nature-based ceremony and healing, shamanic healing, vibroacoustic therapy, spiritual counseling, action method psychodrama, inner child work, shadow transformation, Zen meditation and Tibetan sound healing and Holographic Sound Healing. She has 30 years of experience in mindfulness and meditation techniques for stress reduction, reality creation, transformational energy work, shamanic healing and sound healing. "I activate your creative energy so that you step into health, clarity of purpose and the ability to make a difference in your life and this world. I teach you how to deepen your communication and relationship with all beings and yourself." Jodi is a shamanic advocate for Mother Earth teaching right relationship with all who call Earth home. Tools to lower stress, handle chaos, be authentic and interact with your world beyond shadow and victim consciousness.